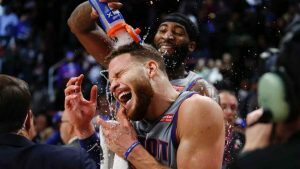 The Detroit Pistons were dribbling down the court late Saturday night, the clock winding down, the victory all but assured. The crowd was asked to rise. It cheered. Andre Drummond waved his arms in the air, trying to make it louder. Saturday night presented a small line of demarcation. After handily beating the defending NBA champions, Detroit improved to 13-7 with its fifth straight win. It sits at fourth place in an Eastern Conference in transition that is currently headed by the 20-4 Toronto Raptors. The thought of last year remains despite a new coach (Dwane Casey) and a new star (Blake Griffin). Why will this be different? It’s tough to truly say, but Casey has consistently implored his players to stay within the roles assigned to them on laminated index cards at the start of training camp. The message can always be good before games count, but it has stuck a quarter of the way through the season — part of the explanation for a Pistons team that seems to believe.